Hi I'm T120V more commonly known as Russ. I use T120V as it's the model number of a Bonnie I bought in '78. It's was 650, 5 speed,disc brake & best bike I've owned. I still have it. Welcome Adrian - from one to another! Had lots of British classics over the years, mainly rovers/MG/Honda the occasional vauxhall and currently a 75 work horse. Have to say the 800 has grown on me. From not that interested in them to owning 2! In only a couple of months. I do my own mechanical work on my cars (time and weather permitting) and love a good tinkering session. Currently looking for a right wing and front bumper in oxford blue if any are about. Anyway, look forward to comparing oil leaks with you guys! Welcome aboard the flagship (in another members words) I have a few oily rags as well thanks to the oil leak on my 827 Coupe. (It needs new rocker gaskets which I have ready to fit soon). Been into 800's all my life and driven them since I learned to drive in my mums back in 2007. (Great car for learning in with no ABS and lots of brake travel) With an old car you get a better feel for dynamics and responses I think. Hope you find the forum very useful. I have 2 820s. 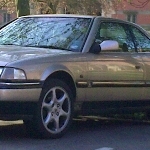 Both 1998 series 2. The sterling is ox blue metallic and could use a replacement driver's side wing. The other is a base 820i fast back. I'm probably going to sell it as I've got too much going on at the moment. I want to concerntrate on the sterling. Welcome aboard Alex! If it's any help i know of a front wing and bumper in Midnight Blue, i know that's not a match for Oxford Blue but it's fairly close and would be a good start. Depends what area you are in though as to whether it would be viable for you. Have i read that right, you have a 1989 820 Vitesse??? That's not a typo and it should be a 1998 820 Vitesse? If you think that question is a bit strange, in the UK in 1989 the only Vitesse available was the 827 Vitesse. Welcome Daniel, please start a thread so we can know more about your car. David Rowcliffe. I use the username of vandenplas2 'cos I've got 2 vdp sd1's. Simple !! Welcome aboard David! Any plans to get an 800 any time soon? Had a few SD1s myself, 2 straight 6s and 5 V8s, great cars! Welcome back Rick - has it really been 4 years! ?